This LARG deals with takeover agreements. These agreements, which often pave the way for the leasing of new space, obligate the landlord making the deal to assume certain obligations of the tenant under its old lease. The first article considers a number of alternative structures for takeover agreements. The second piece contains a checklist for elements that might be included in the agreements. Finally, the Lease Clause Critique looks at a neutral takeover agreement for office space and comments upon its provisions. In the soft office and retail leasing markets of the recent and not so recent past, takeover agreements have become common components of deals made to lease new space. Desirable tenants are almost always tenants in some other building, and are rarely so accommodating as to have their leases expire precisely when the leasing program starts for competing projects. While major space users not already present in the market do come to town occasionally, usually such events tend to be the stuff that leasing managers and developers dream of; they simply don't happen very often. This all means that takeover agreements will continue to be with us for some time, especially in the softer (i.e., those with a substantial surplus of space) markets. Such agreements can take many forms, but essentially they require a landlord to "take over" (i.e., assume or be responsible for) some or all of the old lease obligations of a tenant that occupies space in another building or complex to induce that tenant to move to a new location. The landlord making the deal views the takeover expense as just another cost necessary to do the deal. 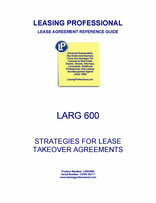 If the aggregate leasing expense (i.e., brokerage commission, tenant improvements, takeover expense, etc.) is justified in view of the economics of the new lease, why not? As quality tenants become harder and harder to attract due to competing space, landlords need to become more flexible in takeover agreements in order to lease space. In many cases, the market just demands it. Naturally, the nature of the takeover deal depends upon the circumstances of the parties, and upon who needs what. But one factor dictates the structure of the deal more than any other--the length of the term remaining on the tenant's old lease. When the remaining term is short, provisions concerning management and remarketing of the old space in the takeover agreement are either abbreviated or unnecessary. When the remaining term is short, most takeover agreements are of the "wait it out" variety where the tenant vacates the old space, moves into the new space, and the new landlord agrees to pay the rent that the tenant would have paid had it stayed in the old space. From the tenant's perspective, the takeover agreement is the functional equivalent of the expiration of its old lease. Of course, this all assumes that both the new landlord and the tenant keep their contractual promises, and that no major problem arises with the old landlord. The simplest takeover arrangement for the landlord is one that reimburses or credits the tenant for qualifying defined expenses associated with the old lease for a fixed period of time. Often, this means that new landlord will reimburse the tenant for rent under the old lease after the tenant signs the new lease and occupies the new space. Sometimes the new landlord simply gives the tenant a credit for rent paid under the old lease following lease signing and the tenant's occupancy of the new space. In addition to its simplicity, this approach can have another advantage for the new landlord--it may not have to deal with the old landlord. Such dealings are usually something the new landlord can do without, since they are frequently acrimonious. The old landlord will no doubt view the whole takeover and relocation exercise as "tenant stealing" and isn't likely to be very cordial to the new landlord. On the other hand, if the tenant, after announcing he is leaving, is obligated to continue to make payments for rent due under the old lease, observe the other leasehold obligations, and handle the details of the move out (including security deposit return, resolution of disputes concerning physical condition of premises, dealing with third party service contracts, etc), so much the better for the new landlord. At least the tenant has a prior business relationship with the old landlord. Not getting directly involved with the old landlord may have yet another advantage for the new landlord, and conceivably, the tenant. Takeover agreements that contemplate the new landlord's assumption of the tenant's obligations under the old lease could constitute the "transfer of an interest" in the old lease by the tenant to the new landlord. Many well drafted pro-landlord assignment and sublease clauses prohibit such transfers absent the landlord's (i.e., the old landlord's) prior written consent. If the old lease contains such a clause, the old landlord's consent to the new takeover agreement may be required. The old landlord is not likely to be gracious and accommodating in such a scenario.